The Eagle County commissioners recently reviewed yet another housing study — there have been several through the decades. From the 1970s on, those studies all painted grim pictures of locals’ ability to rent or buy homes. The latest study has the most dire news yet. If you missed it, the latest study claimed the county — including the Basalt and El Jebel areas — has an immediate need for about 4,500 units. Not quite a decade ago, a similar study by the Urban Land Institute put the shortage at 2,500 units in the Eagle River portion of the county. So, several years and a serious recession and economic slump later, the county’s in even worse shape than it was during the go-go years of the previous decade. There are a number of reasons for the shortage, but two stand out: There hasn’t been a unified effort to create more housing for renters and buyers, and there’s no sustained source of funding. The lack of a valleywide effort that includes all our local governments is a matter of political will, and, in the not-too-distant past, more parochialism than is wise in an interconnected community that stretches more than 50 miles from east to west. The matter of funding is similar. Building subsidized housing in a community where the private sector finds little profit in worker housing has always been expensive, and it’s more expensive than ever now. Where will the money come from? 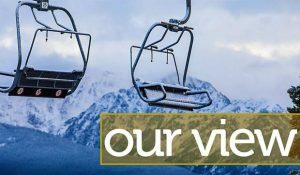 The town of Vail is wrestling with that topic now, but hasn’t taken any concrete steps, but the Eagle County commissioners seem ready to ask voters for a small sales tax increase to create a housing fund. A dedicated sales tax funds much of the countywide bus system, and Summit County has had a good bit of success in using its relatively recent housing sales tax as seed money for developments from Frisco to Breckenridge. If the commissioners do decide to ask voters for a dedicated housing fund, it will be interesting to see the exact language of the ballot issue — it’s hard voice more than general support without knowing the fine details. Once that’s known, it will be even more interesting to see what voters think of the idea.